holiday season), we are back with another TBB Asks. this was a great post to kick off the new year. 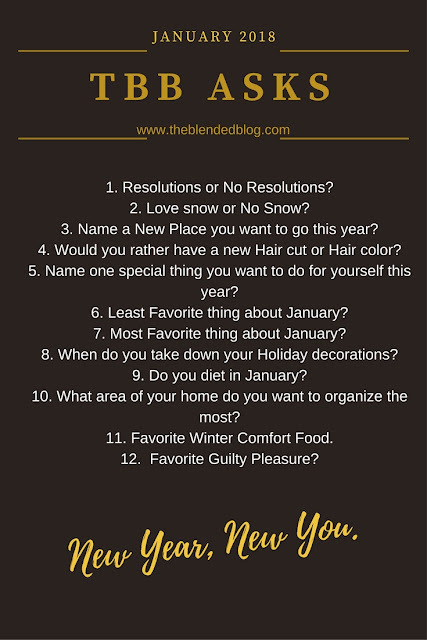 TBB Asks...New Year, New You. 1. Resolutions or No Resolutions? 2. Love snow or No Snow? 3. Name a New Place you want to go this year? 4. Would you rather have a new Hair cut or Hair color? and I'm really loving the look of it. have it black, jet black. 5. Name one special thing you want to do for yourself this year? 6. Least Favorite thing about January? Jenn- the freezing cold weather! 7. Most Favorite thing about January? Jenn- It's my Grandmother's (Meme) Birthday month. apart) and she will be 98. 8. When do you take down your Holiday decorations? Jenn- Whenever Marie tells me to do it. 9. Do you diet in January? Marie- I will be this year. 10. What area of your home do you want to organize the most? Marie- My closets, totally need to re-organize them again. 11. Favorite Winter Comfort Food? Marie- chocolate covered gummi bears. Jenn- Cheesy's 80's Love Songs. Now it's your turn, what are your answers?? Leave them below in the comments. We love hearing from you!! Love your twin comments! Hope you both have a great week! haha i think i'm with jenn more on these. i wish i could pull off black hair though i'm not gonna lie. you rock it girl. and no snow for me. i'm cold just thinking about you guys up there! This is so fun! I love looking at snow but hate the freezing temps! And yes to re-organizing the closets! I need to do that too! These are great-love how so many of your answers are opposite! I love snow, but probably because we get it like once a year! Haha. Chocolate covered gummy bears. I have never had these, but they sound amazing! I don't mind the snow too much but it can be dangerous - and annoying after awhile. These posts are always so fun! I have to have our decorations down before the New Year. I like to start fresh in January! chocolate covered gummy bear do not sound good. I like the snow just not all the problems it creates.. like commuting..
also hate when it stays and starts to get dirty..
You two are hilarious. Also I have never had chocolate covered gummy bears. Now I'm intrigued. I love how similar but different all of your answers always are! I just love the snow, and I wish that we got it more down here! I love your responses to taking down decorations haha! I always seem to take them down on New Year's Day. As much as I love putting Christmas decorations up, I love how clean it feels once they come down! Hope you guys had a great holiday! I love how different you guys are. I am with you on not doing much to my hair. I get too scared! The best landing page design company in India . Klifftechnologies provide SEO services in CR park delhi, and these services provide is according to your budget. Our experts first perform a technical audit of your website to identify issues.